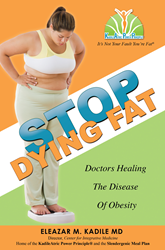 In “Stop Dying Fat: Doctors Healing the Disease of Obesity,” Dr. Eleazar Kadile, who specializes in treating patients with obesity and associated chronic disease, gives readers and clients a prescription for a successful diet plan, which works best if you’re comfortable with change. “I call it the KadileAtric Power Principle®, a comprehensive lifestyle program requiring those who need it most – the severely obese – to learn how to embrace change,” says Dr. Kadile, director of the Center for Integrative Medicine. “Stop Dying Fat: Doctors Healing the Disease of Obesity” is the definitive prescription for a successful diet for the hard to lose obese with medical complications. Kadile, an M.D., advocates that obesity must be treated like any other life threatening disease: immediately and aggressively. His Slendergenic meal plan emphasizes losing dangerous fat, by replacing all synthetic and processed food with natural and organic alternatives. The book consists of four power principles as part of the prescription for a successful diet that serve to repair and revive the body through rapid weight loss with a Slendergenic meal plan that is low in carbohydrates and high in protein and healthy fat intake. “I have lost a total of 80 pounds. I am very, very happy with the success that my mother and I have had with Dr. Kadile’s weight-loss program. My emotional state is much improved. My energy level is also greatly improved. All I can say is that the KadileAtric Power Principle is an awesome program!” – Dan Sickinger, an accountant and husband from Brillion, WI. Dr. Eleazar Kadile is a complementary physician who specializes in treating patients with obesity who may suffer from heart disease, hypertension, type-2 diabetes, arthritis, depression or ADHD. With decades of medical experience throughout the United States, he has been developing a comprehensive and systematic approach to battling obesity. He is the director of the Center for Integrative Medicine in Green Bay, Wis. (http://www.kppmd.com).